Here’s what’s happening in the world of television for Monday, May 14. All times are Eastern. 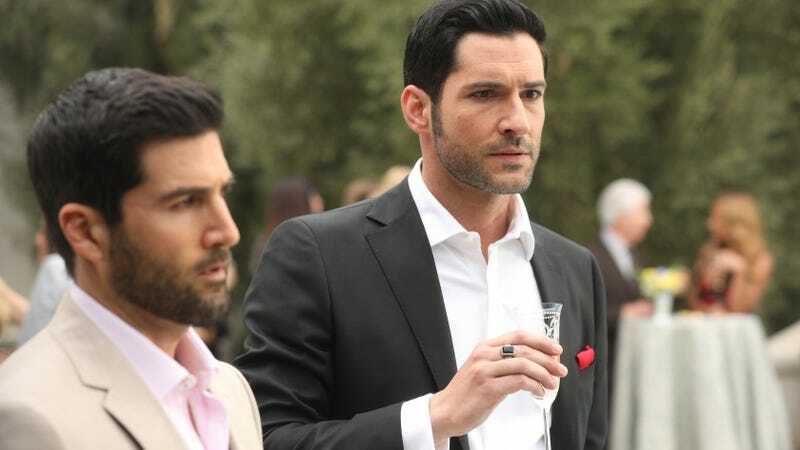 Lucifer (Fox, 8 p.m.): In its penultimate episode, Lucifer took some really dark turns, killing off a resurrected character while dooming someone else after their innocence was proven. We don’t expect things to lighten up in the season-three finale, “A Devil Of My Word,” which pits the Devil (Tom Ellis) against a very evil man (Tom Welling). You’d think having Chloe (Lauren German) by his side would give Lucifer especially good odds, but judging by this promo, her presence might only complicate matters. As ever, LaToya Ferguson will report from the frontlines. SuperMansion (Crackle, 3:01 a.m.): Saturday Night Live’s Mikey Day joins the voice cast of SuperMansion just in time for the animated series’ Punisher parody. As Max Penalizer, Day plays a vigilante who thinks he’s above the law, and above asking for Titanium Rex’s (Bryan Cranston) approval in dating Lex Lightning (Jillian Bell). Soon, Rex finds himself teaming up with his arch-nemesis Dr. Devizo (Chris Pine) to put an end to Max—or maybe just his relationship with Lex.